Online lenders and agents making little headway among Millennials, according to CentSai survey. When it comes to home buying, millennials are much more traditional than previously believed, according to a recent survey of 2,050 Americans aged 18 to 34 conducted by CentSai, the financial wellness community. Three-quarters (75%) of respondents said that they would use a local real estate agent instead of an online agent, reports CentSai. Almost three-quarters (71%) said they would choose a local lender. Online mortgage lending and brokerage services are expected to transform home buying, but millennials surveyed by CentSai said that – contrary to popular belief – they prefer local providers due to existing relationships and local knowledge. 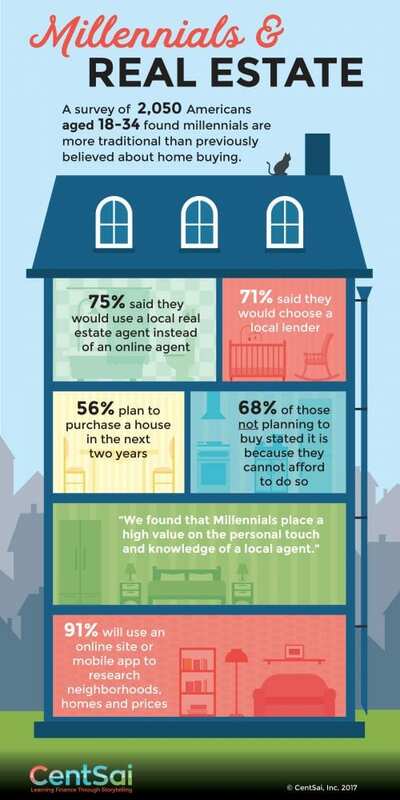 Likewise, the survey reveals that online real estate agents seem less popular with millennials than expected, despite advertising cheaper overall service via mobile apps. That said, the vast majority (91%) of millennials surveyed said they would use an online site or mobile app to research neighborhoods and home prices and to identify houses that they might buy. The survey respondents cited various reasons for going local, including personal touch and handholding, longstanding relationships, local knowledge, and amount of hassle. More than half (56%) of the millennials surveyed by CentSai plan to purchase a house in the next two years. Of the 44% who said that they did not plan to buy a house in the next two years, more than two-thirds (68%) said that they are not buying because they cannot afford to do so. Only 12% said they preferred the freedom of renting, and 10% cited student loan debt as a reason not to buy in the next two years. CentSai also released a special in-depth real estate section featuring everything millennials need to know about home buying, from mortgages and homeowners insurance to DIY home repair. Centsai’s mission is to make learning personal finance skills approachable and fun for young Americans through every stage of life. CentSai provides financial wellness education through its two platforms: CentSai, which serves millennials (those born between 1980 and 2000), and CentSai Adulting, which is for teens. Both platforms spread invaluable personal finance information through storytelling in blogs and videos, as well as expert commentary, Q&As, podcasts, and more. This survey was conducted using randomized participants between ages 18 and 34 who live in the United States. No particular state or region was targeted over others. The survey was formulated to ask participants if they would use an online lender or agent over a local one, and what amount of commission they would be comfortable paying. Based on the answer to the question, “Do you plan on purchasing a house in the near future (0-2) years?” we filtered the participants to other questions. *Fannie Mae’s 2015 National Housing Survey found that 70 percent of recent homebuyers would like to obtain a mortgage quote online, and that 69 percent would like to complete a mortgage application online.